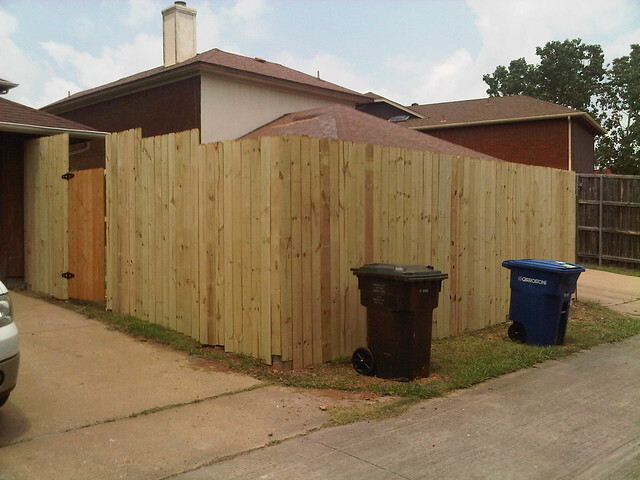 Marissa and I built this fence (and demo'd the old one) over memorial weekend. I have been beating the crap outta myself. I have major PF in the left foot, and I did not do enough to rest it this week. After a good swim on on Monday I was looking forward to doing the 1500 meters on Tuesday, BUT a thunderstorm blew in and they canceled the meet. Instead I ran around the greenhill campus for 30 min until the threatened to throw me out because of the lightning! That left me feeling pretty good for my Wednesday run and also for intervals on Thursday. All of that left my foot pretty sore on Friday. Friday was a good swim, some of it with Deno - Ron and Harold were no shows for the holiday weekend. Saturday I had 6x400 at SMU and apparently I went out to hard on the first three because I had nothing left for the last three. After that, Marissa and I spent the afternoon tearing down an old fence at my rental property and putting up an new one. My foot was really splattered after that day. Sunday was a short ride down to LBJ and back. Saturday May 28: SMU: 6x400PU (Recovery ) 8 Miles run. Sunday May 29: Solo Bike down to LBJ and Back (Ave 16.6, CAD 74,Ride Time 1:52, Temp 77) 30.9 miles bike.